My friend Margaret happens to be the person who turns my hair color from un-pigmented to fabulous. Perhaps because this hair coloring process takes a ridiculous amount of time, Margaret and I have ample opportunity to chat. In addition to comparing bargain purchases and restaurant experiences, we talk about baking. Margaret’s enthusiasm for King Arthur Flour products made me a fan as well. As a result, I am a frequent visitor to the King Arthur forums and recipe archives. Then, she began raving about King Arthur products only available online. Though my recipes for The Monday Box only contain ingredients easily found in supermarkets, for personal baking I quickly became enamored with numerous items available only through King Arthur. One of those items is King Arthur cappuccino chips. The chips are delicious, expensive, and difficult to ship in hot weather. There are no substitutions available locally, that I know of. Because I have been doing a lot of experimenting with white chocolate chips lately, I told Margaret that I would work on homemade cappuccino chips. I know that I promised to lay off the “exciting chip adventures” for awhile, but this one was by request. I didn’t plan on posting about it any time soon, but then an Angel presented me with the perfect cookie for cappuccino chips. I was very excited to find and purchase a second edition copy of Angel Delights, Treasured Cookie Recipes from Soldiers’ Angels and Friends. This 232 page un-illustrated cookbook is filled with favorite recipes from Soldiers’ Angels bakers. These are recipes that have made the care package journey to deployed troops and received rave reviews. 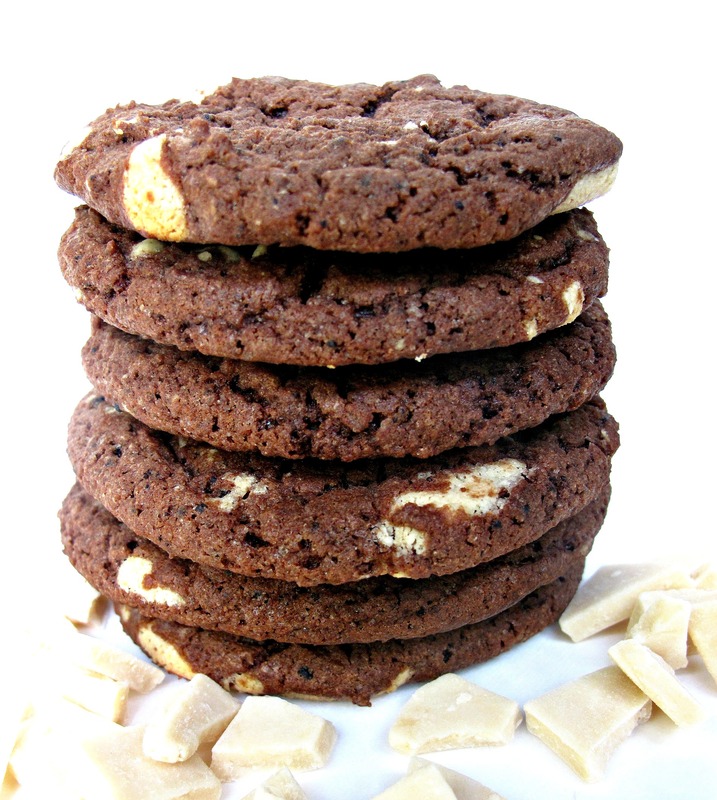 On page 72, I found a desert safe recipe from Tammie Dillard, a Soldiers’ Angel in Texas, for Fudge Cookies. What better home could a bunch of cappuccino chips hope for?! Making cappuccino chips are just a quick extra step in this recipe. You could certainly skip this step and use any other chip that you have on hand. I recommend taking the extra step. The chips, made with white chocolate chips and coffee extract, are really good. 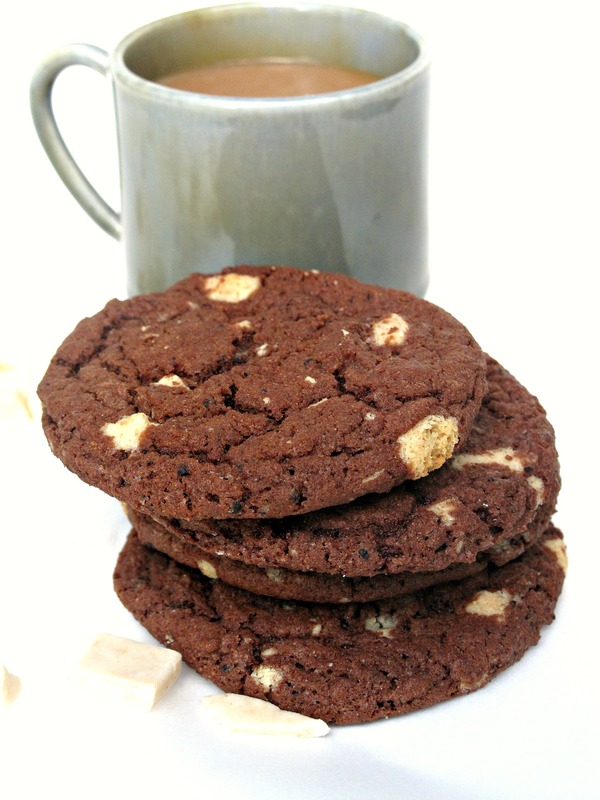 They are not a replica of the King Arthur version, but they add a Kahlua-like creamy coffee flavor to the cookies. Making the chips (chunks) takes about 15 minutes. 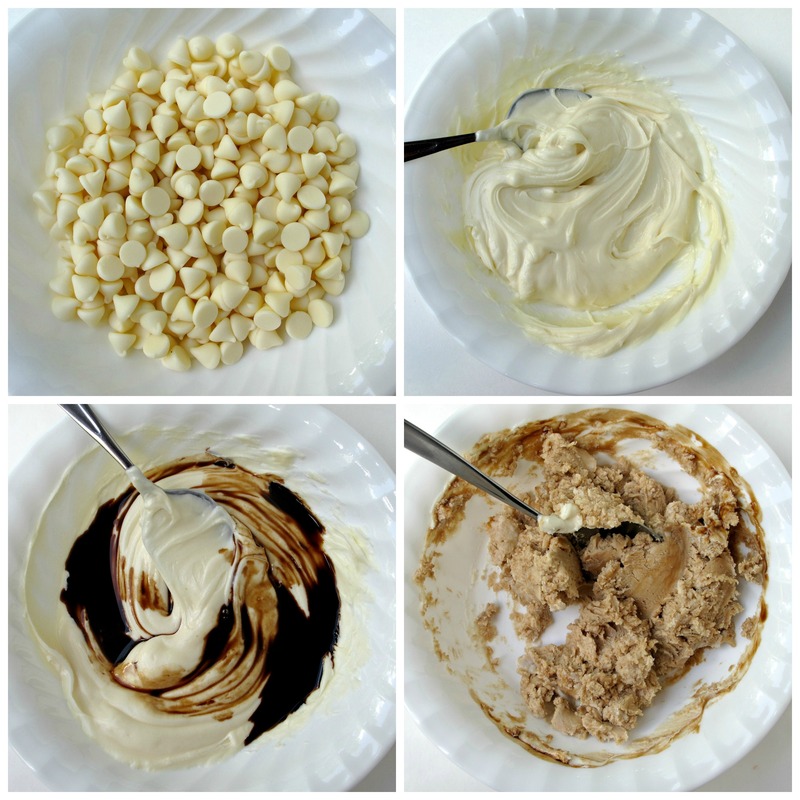 The white chocolate chips are melted, then the coffee extract is mixed in. When the extract is mixed in, the melted white chocolate will seize up and turn into a thick dough-like substance, so mix quickly. Though the seized up chocolate looks like a disaster, or at least an unsuccessful adventure, it actually rolls out smoothly between two sheets of waxed paper. Ten minutes in the freezer and the coffee flavored disc is ready for cutting into chunks and mixing into the cookie dough. One additional bit of baking trivia that I learned while investigating this recipe is the process of “blooming” cocoa powder. This recipe calls for pouring a tiny amount of boiling water over the cocoa power before mixing it into the batter. It seemed unnecessary to me, but who am I to question an Angel? Then I stumbled upon a David Lebovitz explanation for the boiling water step. Apparently, adding boiling water to cocoa powder is called “blooming” and is used to intensify the flavor of the cocoa, even if the amount of boiling water added only produces a dry, crumbly cocoa mixture. Follow the recipe, even if it seems goofy. This post successfully completes my personal challenge to post only desert safe recipes during the summer months! I am sure dessert safe recipes will continue to appear throughout the year, just not exclusively. The twenty desert safe recipes I posted are great hot weather care package items as well as year round at home desserts. 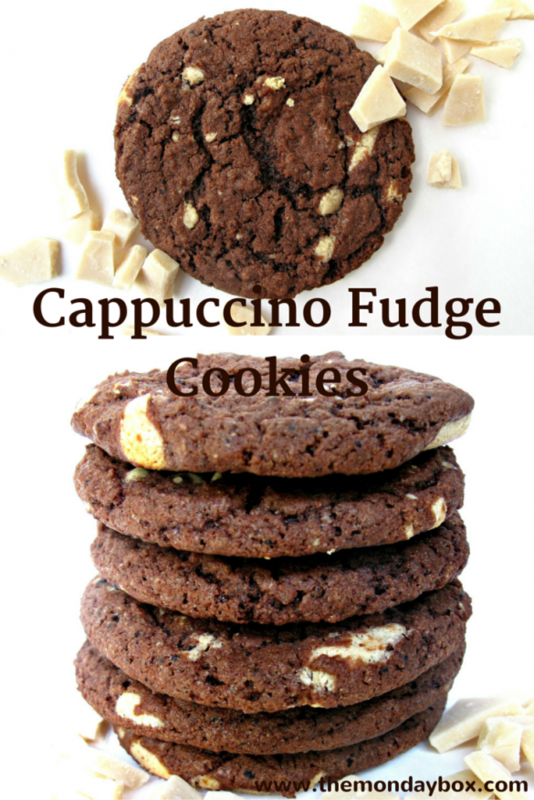 These Cappuccino Chip Fudge Cookies are chewy and full of fudgy coffee flavor. The original recipe called for vegetable shortening and they are so good (flavor and texture) that I didn’t experiment with any other variation. Stored at room temperature in an airtight container, these cookies stay chewy for a few days before getting slowly crunchier. They are a great dunking cookie for at least 10 days. 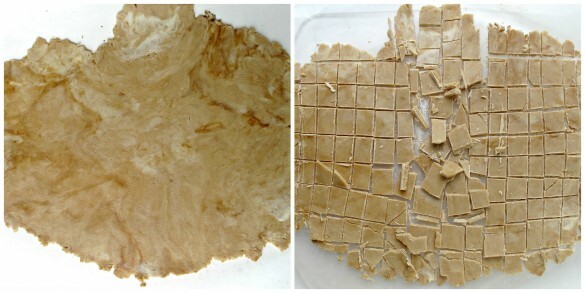 FOR CAPPUCCINO CHIPS: In a small microwave safe bowl, melt white chocolate chips at medium power for 1 minute. Stir. If not completely melted, return the bowl to the microwave and heat for 10 second intervals, stirring between intervals, until melted. Add coffee extract and stir quickly to blend as evenly as possible. The mixture will become thick, crumbly and dough-like. Place the chip dough between two sheets of wax paper. Using a rolling pin, roll out the dough into a disc 1/8” – ¼” thick. Chill the disc until hard set, about 10 minutes in the freezer or 15 minutes in the refrigerator. Once hard, chop or break into small chunks. FOR COOKIES: Preheat oven to 350 degrees F. Line a cookie sheet with parchment paper. In a small bowl, mix cocoa and boiling water. This “blooming” process intensifies the flavor of the cocoa. The mixture will be dry and crumbly. In the bowl of an electric mixer, cream together shortening and sugar. Place 2 tablespoon scoops of dough on prepared cookie sheet, at least 2” apart. Bake for 12 minutes. Cookies should be set but still appear shiny in the cracks that form on the surface. Allow cookie to cool 2-3 minutes on the cookie sheet, until firm enough to transfer to wire cooling racks. 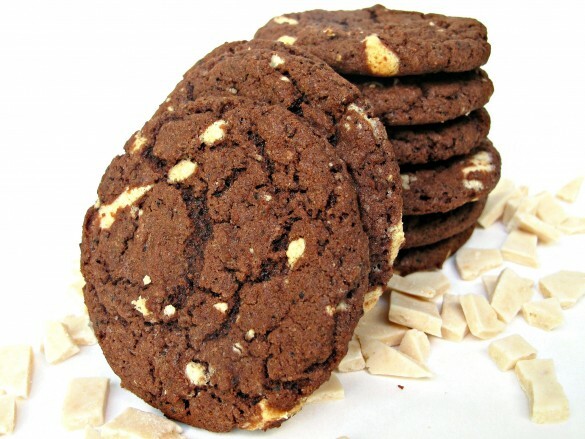 Cookies will remain fresh 10 days or longer when stored at room temperature in an air tight container or zip lock bag. 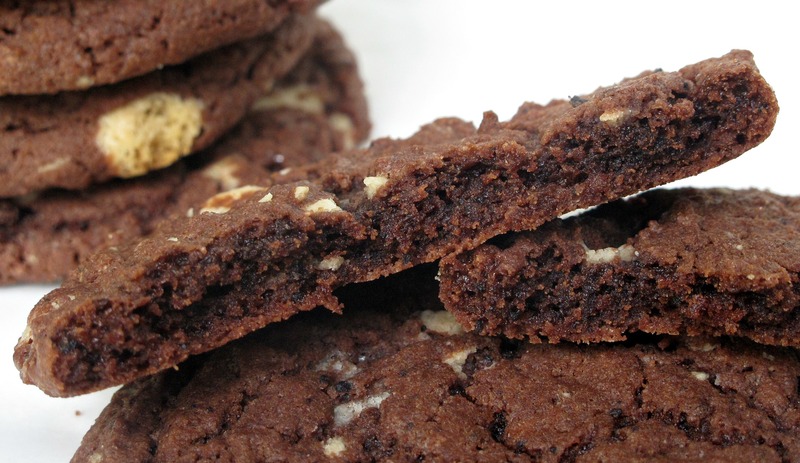 These cookies remain chewy for 3-4 days and then become crunchy. 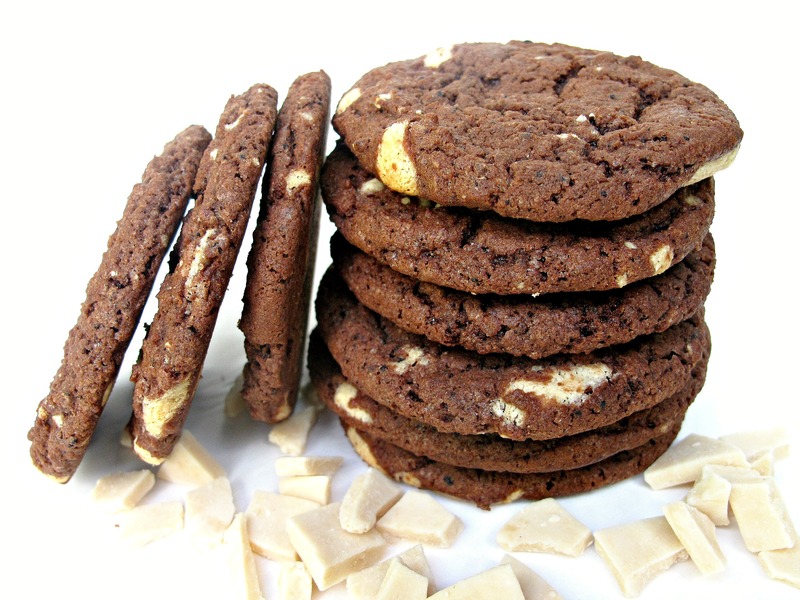 Double wrap pairs of cookies (with bottoms together) in plastic wrap, then place in an airtight container or zip lock bag. For longer storage, vacuum sealing is recommended. What a neat idea! Cappuccino chips sound like such a fun ingredient! What a brilliant way of replicating a flavoured chocolate chip! I would’ve never even thought of making my own so thank you thank you thank you for the idea! They don’t sell King Arthur products in Canada so I’m always jealous when I read all the other bloggers using their stuff. I should stock up the next time I’m in the US. These cookies look fabulous! Thanks, Nancy! I have definitely been on a playing-with-chips kick. The flavored white chocolate seems to work as long as the vanilla flavor of the white chocolate chip goes with the flavor you are adding and you roll out the dough that forms from the seized white chocolate mixed with extract. King Arthur won’t ship products to Canada? A lot of there items are only available online in the US…at least I have never seen them anywhere except online. Their flour is in supermarkets and Sur la Table has some of their mixes but I think their flavorings and chips are an online thing. I’ve never gone onto their website to see if they’d ship here. I’m close enough to the US border that I can easily drive down and stock up. I’m definitely going to try flavouring chips. I’ll let you know how it goes! 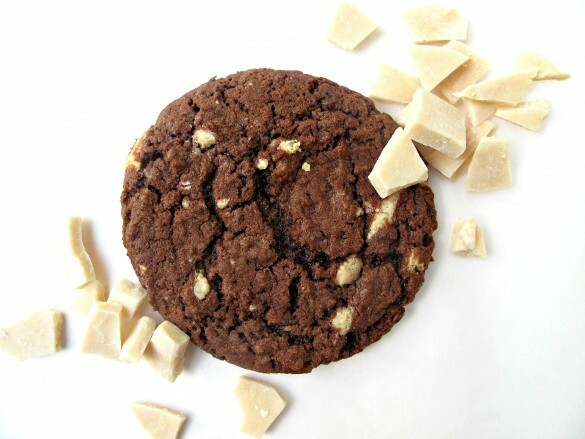 You mean I can have my coffee, my chocolate, and my cookie fixes all in one glorious cookie?!?! MIND = OFFICIALLY BLOWN. 😀 Love this recipe, Wendy! i, for one, love your chip adventures. I’ve never seen cappuccino chips anywhere (except for the KAF ones), so this is a great alternative to ordering some (and more affordable, for sure). I’ve never heard of blooming cocoa powder either, but i’m definitely going to try it; i wonder why none of my cookbooks make reference to it? I’m going to do some research. I love what you did with the flavors here, Wendy; and ten days store time! that’s wonderful. sometimes when i’m adding something to melted chocolate (although white chocolate is the touchiest of melted chocolates, in my opinion), it helps if you add it slowly while stirring; a little at a time. white chocolate does seize so easily, so sometimes it’s completely unavoidable, but i’ve done it that way and had it work before. Thanks for the melted chocolate tip, Shannon!! I will try adding the extract a tiny bit at a time. When it seized up, I kind of expected it and didn’t think to try it slowly. I was so surprised that it rolled out smoothly though! It looked like a disaster (or certainly a flop) and it was only its resemblance to cookie dough that made me think of rolling it out between wax paper. 🙂 I am going to look for alcohol free coffee extract because I am wondering if that might make a difference too. Did you click on the David Lebovitz link about blooming? The recipe I used said, “my mother’s recipe”. Maybe it is an old (?out dated?) technique or something done more in Europe. Let me know what you find in your research. Chocolate is so outside my skill set!! You always have so much patience baking. I envy you. 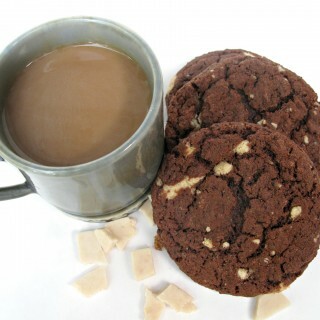 I love cappuccino and coffee flavored things, I know I would devour these cookies in record time. I am not sad to admit that either! 😉 Thanks for all you do with your recipes for desert safe products…you rock! Cappuccino and fudge? What a delicious combo! This cookie sounds amazing Wendy! Thanks, Anne! Chocolate and coffee is probably my favorite combo. Really coffee anything is a favorite!! I love this Wendy! I’ve thought about buying those cappuccino chips before but just never did. And now I need to try making them at home instead! 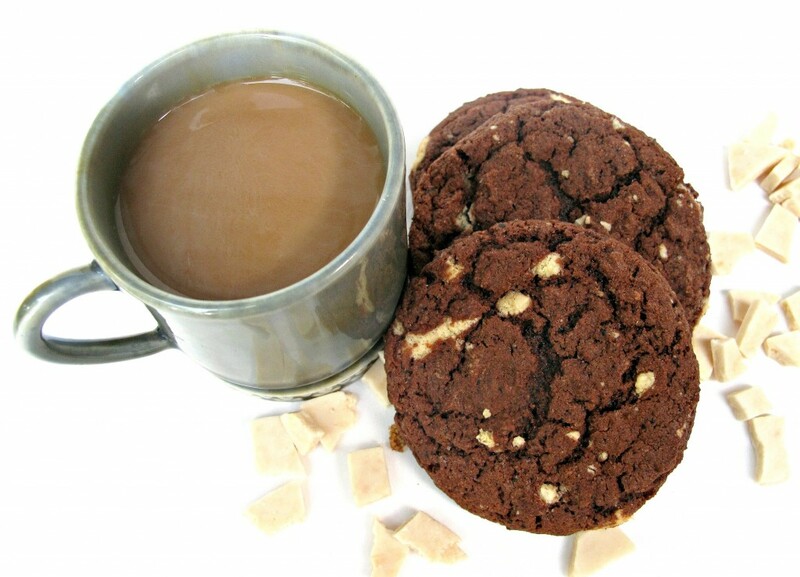 Plus, cappuccino and fudge cookies sound rightttt up my alley. I could eat quite a number of these in one sitting! Thanks, Ashley! The King Arthur chips really are good and I recommend them highly for something special, but for everyday cookies (What? doesn’t everyone have cookies every day?!) $7 plus shipping is a bit much. Homemade chips do the trick. I love cappuccino flavor in all kinds of baking! You are a genius to make your own chips!!!! LOVE! I am waving hello from the Philippines! I hope you still remember me? It was great meeting you at the Food Media Forum last month. I didn’t have the chance to visit your blog earlier because of an emergency trip back home. One of my childhood friends gave me some cacao balls, i wonder if it will work with the recipe. I can’t wait to get back to try ir. Your photos are stunning. Your cookies look so chewy, if only i could grab one right now haha. Hi, Malou! I really enjoyed talking to you (and learning about some Filipino food)at The Food Media Forum! I am so sorry to hear that you had to make an emergency trip. I hope the situation has improved and you are doing well! I love that you made your own cappucino chips! 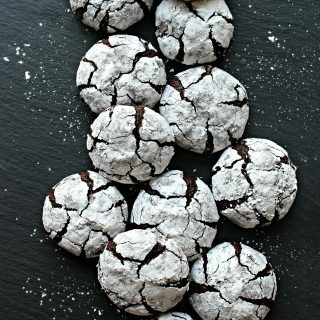 I bet they’re absolutely delicious in these fudgy cookies! Such a great flavor combo. You are pretty awesome for coming up with 20 recipes! That is quite an accomplishment. Thanks, Reeni! I learned so much working on desert safe recipes. The bottom line is I really hope they are useful to the bakers sending care packages to desert zones! Playing with chocolate chips…flavors and colors….is just fun! !